Commencing soon, Registrations now accepted. Two passes in G. C. E. (A/L) / London (A/L) in Mathematics or Bio Stream or followed Level 2 Technician Certificate in Telecommunication Systems. Two passes in G. C. E. (A/L) / London (A/L) in Mathematics or Bio Stream or followed Level 2 Certificate in Electrical & Electronic Technology. 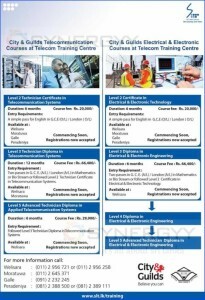 you can contact to Sri Lanka Telecom Training Center by 0112 645 371, and you can get more information about it.